Definitely been enjoying my mostly pure Python hacking recently. It feels so…empowering. Like I can just sit down and bend the computer to my will, instead of fighting details. Put up the code for the guest-account project for Fedora, based on a quick discussion/design session with Bryan about how we can improve account creation and login process. The current code is functional but could use a bit of polish. I had to drop back into C-land to make GDM able to execute my little PyGTK program, but it works. Hoping to squish some of the details in that patch and get it into GDM, then the guest-account programs polished, probably into GNOME SVN, and packaged for Fedora. While stuck at the Chicago airport yesterday (and I do mean basically all of yesterday, thanks United), spent a bit of time getting a new release of Hotwire out the door. Nothing earth-shattering, but some important bugs have been fixed, and I’m getting ready to add a dependency on Twisted so Hotwire can start doing some cool things over ssh. Seeing an item listed at $2.95, walking up to the register, and actually paying $2.95 (instead of $3.1x and therefore receiving a big pile of change) is something I could get used to. Really fast. Portland has quite a lot of punk. If I still had my early-college ear piercings I’d probably fit in better. I first realized Portland was punk when a 50s-ish woman with dyed blue hair, black leather jacket, and this T-shirt (unrelated photo found via Google image search) walked by while I was eating lunch. The cat seemed…well practiced at staying in that position. 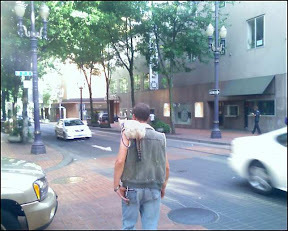 I have to admit, witnessing punk-guy-with-siamese-cat-on-shoulder was a new experience for me. 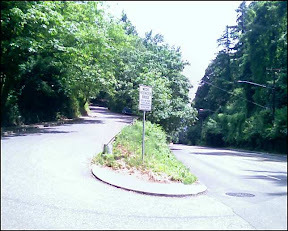 I had two choices for speed, embodied by the above photo: Thigh-exhaustingly slow, or pedestrian-creaming no-hope-of-stopping fast. I spent most of the time with my blades detached, walking.